​Nora Oliver Angell founded the Soquel Pioneer and Historical Association in 1938. During an "old-timers" picnic at Pringle Grove the following summer, she was elected to serve as the first president. The Grove had been a popular spot for outdoor events since the 1880s. The wooded setting became a traditional site for pioneer gatherings, and owners Lloyd and Annie Pringle decided to make it a gift to the community. The deed was granted to the association in 1945. 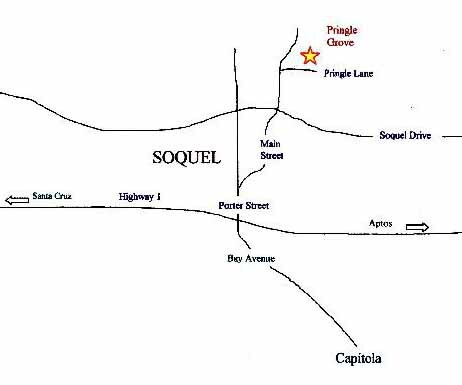 Today members and enthusiasts of Soquel history meet on the last Saturday in July for the potluck picnic and program that begins at noon. The afternoon is filled with stories, the sharing of photographs, and speakers who talk about the town and its settlers. The mission of the Soquel Pioneer and Historical Association is to "preserve our local history and educate the public on our past."